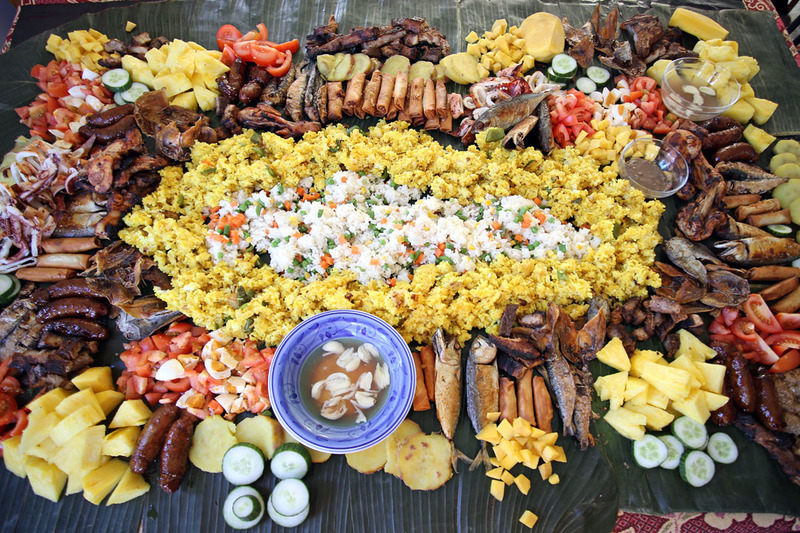 What is a Boodle Fight? 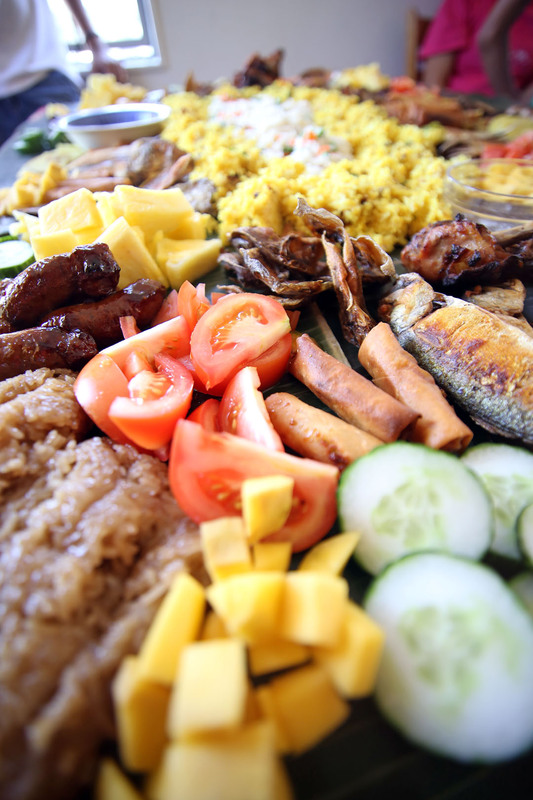 So what is a Boodle Fight? Recently this culinary experience is gaining popularity not just in Philippines but as well as overseas like in New York, UAE and even here in New Zealand. This Filipino tradition of eating originated from the Philippine military where a big pile of food are served in the middle of a really long table in a mess hall where every hungry soldier eats with their hands symbolizing of camaraderie, brotherhood and equality in the military. The “fight” in the name refers to the act of grabbing and eating as much as the soldier can before others grab them or runs out, remember this is served to very hungry men so if you’re slow you will definitely run out of food. Usually food are served on top of a table lined with banana leaves, rice is placed in the middle and viands are either served on top or on the sides of the rice. Water jugs are also placed on the side used for washing your hands just before the “fight” happens. No utensils are used when eating and you will use your bear hands to eat so this is definitely not a fine dining experience but trust me it’s way much more exciting to do this rather than those ones that have multiple sets of cutleries and glassware in front of you. As for the dishes there are no set rules in what to add but the most popular ones are the dry items like fried dried fish like tuyo, danggit, and pusit. Breakfast meats are also popular like tocino, longaniza and tapa but the favourite ones are the charcoal grilled meats like fish, chicken and pork. 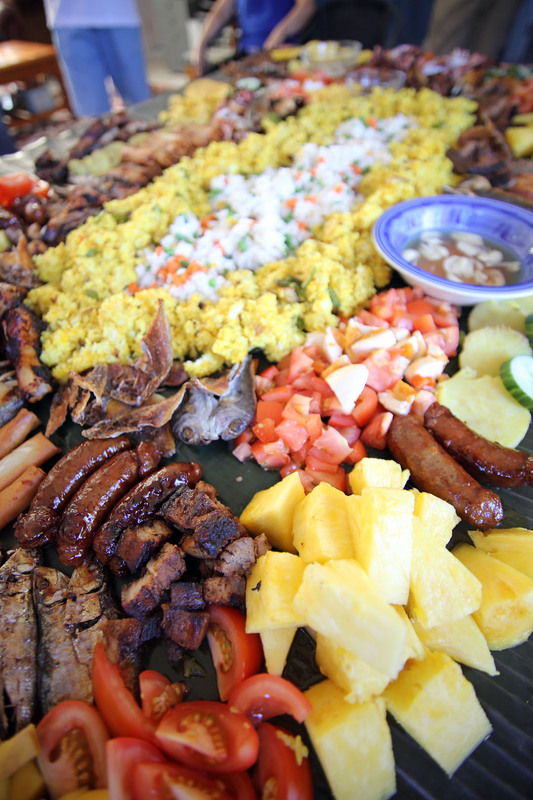 With all of these meats fruits are served to serve as a balancer to the salty and oily viands so it’s very usual to see pineapples and mangoes, there are also some vegetable salads like itlog na maaalat, talong, okra, atchara to name some. That does not stop there some also add deep fried items like lumpia, fried fish, fried chicken then to top it all up rice and noodles will the carbohydrate source. Looks a lot, yes because there is a lot of food items in one table so I suggest if you are doing this make sure everyone is hungry (serve it right after swimming, tramping, etc.) to experience the real “fight”, you will notice everyone will be very busy eating they don’t bother talking to each other and if you are a slow eater then good luck to you. Will you ever try this? What are your thoughts on this Filipino tradition? What a fun meal! I’d love to do this. I feel like our breakfast counter looks similar in the mornings! What a wild tradition! I’ve never seen anything like it. I can imagine with a group of hungry people, how fast this would go. This is a smiliar experience to when I set platters food out in front of my teenage boys for the whole family for dinner. They must think it is an army maneuver as they just pile it all in as fast and they can… LOL Thanks for introducing us to this tradition. I want in on this! Looks wonderful! Well this sounds like fun! What a stupid way of eating. Totally loss of cultivated eating. Its primitive, teaching children and young people to eat till they are fuller than full. At Philippines many people are overweight and sick. Its not stupid but its more of a tradition, I guess people who call it stupid are those who does not have any respect with customs and tradition. I feel sorry for you that you think it’s stupid, I guess you are one of those born with a silver spoon in their mouth. It is fun and good bonding ( family or friends) thing to do. Again I’m so sorry for you because you are a total IGNORANT! Sorry, I am not ignorant but concerned about hygienic standards at Philippines. I am living at Philippines and am involved in a medical program to improve heproducts children and young adults. We made hygienic tests at boodle fights. The results are shocking. In an average British CR are less bacterias than in a boodle fight ulam about ten minutes after opening. I respect the social aspects and the tradition. I could see the fun people had. But also could see the risk for healt, especially by chicken products (Salmonella). We also could find pinworm eggs in many of the meals. Sorry, this is not a personal view and not phantasy of a silver spoon guy, it’s result of research work. I wish to correct Norbert. Fine dining in first class hotel aint the best culinary satisfaction; even the drug lords do that. In fact, it could even be personal for you might be eating next to a murderer. To say that you are using gold spoon also do not add a bit to the recipe. Boodle Fight which originated from the jungle among soldier has a great culture per se since they are the people that save you and me from those who might be eating in your banquet. We did boodle fight in my school in Marikina and the parents that ate with the teachers and their students really enjoyed it. Very personal, it’s not pleasurable, it’s happiness and we are a bunch of educated people. You are doing it not everyday but only once in a while. Sorry, I never told that eating in a 5 star restaurant is better. It’s same stupid. I have been at boodle fight at Philippines. Many overweight children and parents had fun. All what I can say is, that not all traditions are healthy and reasonable. I think its a big difference if there are hungry soldiers or people who every day have much to many calories. The next point is hygiene: 50 hands going from the mouth to the food and back. A good way to spread germs and viruses. I have seen people with running nose eating at that boodle fight. I respect traditions, but I also am thinking if some traditions are reasonable. Norbert your imagination shows how uneducated and misinformed of a person you are. Most “Boodle Fights” in the Philippines. now are done in a more civil manner not as what your hallucinations and fantasies are telling you. As the article says this event is organized & done to promote camaraderie and friendship among soldiers before and even now it’s being done with different organizations, schools and groups of people in a community. Nowadays, Boodle fight is not just an ordinary affair as what you think and hallucinate of since it requires more to organize such event. Promotion of culture, meeting new friends and social development is what it’s all about. Sorry Raymund. I am living At Philippines and have been at many boodle fights. So I don’t think that I am uneducated – what ever this means for you. I also think that no one till now read my twxt , my concerns are about hygienic standards. But, sorry to say it, many attitudes at Philippines are “non educated” unhygienic. I have never seen a country in the world where it’s same dirty as at Philippines. Norbert you are clearly an example of uneducation and hallucination combined and evolved into a living thing. I feel sorry for you claiming how dirty a country is while you forgot to see how dirty are those things coming from your own mouth. You obviously need some psychological help claiming to live in a country which is dirty and unhygienic, doesn’t that make you one too? LOL..i like your question to this ignorant guy..ok Norbert tell us what things did you insert in your mouth then..
Norbert, I was just wondering what your background is? I mean, are you Filipino? Or different nationality? You live IN the Philippines.. NOT “AT” the Philippines. You say it’s a dirty country… but what are you still doing there if you’re so worried about health & hygiene? I live in North America & the beautiful city I live in has a very high standard on health & hygiene when it comes to Restaurants/Eateries. You cannot operate them if you didn’t PASS the Health/Hygiene inspections & not get a “Green” Certificate. There’s a couple of Filipino restaurants that I know of that offer Boodle Fight type of eating here not only popular with Filipinos but with other nationalities as well. If you’re not a big fan of boodle fights there then don’t try it… & if you really think it’s a dirty country then why don’t you just pack your stuff & LEAVE.? Simple as that. I have been to Manila and Cebu for work and the Filipinos I met will not do well in progressive countries. Very little regards to hygiene. I have been invited to these type of events where they dump a bunch of food and people go at it like animals. Bunch of dumbasses. The only dumbass here is you pete “hygiene god”. Putangina mo norbert to the highest degree! You are the stupid one. Gago! Just goes to show you dont know what you are talking about. 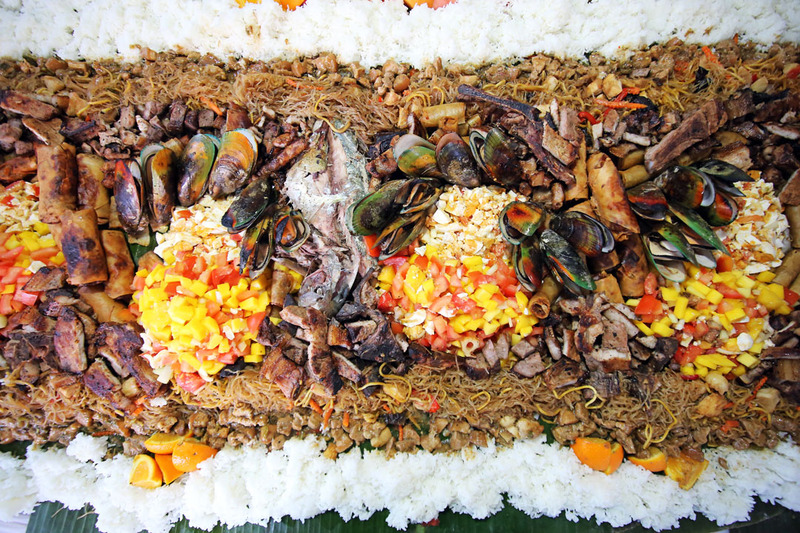 Nothing better than a ‘Boodle Fight’ to boost the immune system! By the way, I got invited by Philippines health organizations to help to improve hygienic standards in Hotels and Hospitals. So I am thinking I know as biologist and health care specialist what I am talking about. Stay calm and think it over before you turn offensive.